Today was my second bookbinding class at the Craft Guild of Dallas. I didn’t tell you about my class last week because all I did was cut paper and I’ll admit cutting paper is my least favorite part of the whole process. Today was my favorite though, sewing. I love to sew and learn new stitching techniques. Our studio is well-equipped and I’m taking note of a few extra things I need to get for my own studio (I don’t really have a studio – it’s just that my living room has sort of morphed into one). 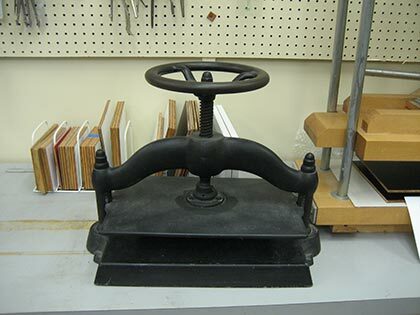 For example, isn’t this book press great? I wish I could get my hands on one of those. Anyway, for my first project I’m learning how to make a multi-signature hardcover book. I’ve made one before but it’s been a long time ago so I actually feel like I’m learning it for the first time. I think in our next class I will probably decorate the book boards. It’s a slow process but so worth it. Unfortunately, I don’t think I’ll have any show and tell for a while but stay tuned. And, good thing I’m back to making books because I just ordered, Journal Revolution, so I’m sure I’ll need lots of blank books to play with. Wow, I’d love to hear more about this, and to see your finished products! 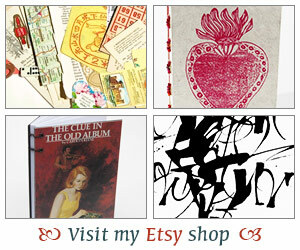 I did a book binding class once and it was fun. Trouble is, the book I made never got used, I loved it too much…Haha! Lucky you to live where classes like this are offered! I’d love to take a book binding class, but for some reason, our area doesn’t pick up on the demand for this sort of thing. New Orleans, before Katrina, had some workshops offered in the book arts, but never anything locally. I have several books on making art journals, but they haven’t been off the shelf in a long while, and I mostly just turned the pages and admired the creativity of others. I’d love to see what you’ve made – it sounds like fun! How cool. I’d love to learn how to do this. One of the librarian’s in my library actually has a whole press in her house as her area is hand made and hand set books. Wouldn’t that be nice! Looking forward to seeing the finished product. How old is this press? Are the modern ones like this one? You are learning so much that you should be able to teach a beginner’s class soon! Gentle Reader – I’ve been dabbling in bookbinding for a few years now. Since I’m out of work at the moment I thought I’d take some time to learn some new stuff. I promise to post pics. Kisane – You know, the first books I made I don’t write in either. I keep those as my “learning” tools. Jenclair – I have tons of books on bookbinding too but of course I prefer to learn by seeing and doing. It’s a shame you can’t find a class or workshop near you. Tara – It is a lot of fun. I also need to post pics of some of my past projects. Just need to get my husband to help with all that! Chrisbookarama – It is! I love bookbinding. I would also love to see the finished product! What a cool thing to do. Nymeth – I will definitely be posting pics!